10 Best Places to Visit In Abu Dhabi - What comes to mind when you hear the word Abu Dhabi? Yep, must be desert, and towering skyscrapers penetrate the sky because Abu Dhabi is a city surrounded by desert and is included in the network of the United Arab Emirates. Abu Dhabi itself is the capital and the second largest city in the United Arab Emirates (by population), and the largest of the seven emirates that make up the United Arab Emirates. Besides Abu Dhabi in the United Arab Emirates, there is also Dubai. The distance between Dubai and Abu Dhabi is not too far away, only about 2 hours by road. Although not as popular as Dubai as a tourist destination, Abu Dhabi also has a tourist attraction that is not less interesting. In Abu Dhabi, a lot of amazing tourist destinations, what are the tourist attractions in Abu Dhabi. This is it. Sheikh Zayed Mosque is the largest mosque in the United Arab Emirates and is also one of the largest mosques in the world. Its construction was initiated by Sheikh Zayed Al Nahyan former president of the uni emirate Arab. After his death building in the proceeding by his son sheik khalifah bin Zayed al Nahyan. 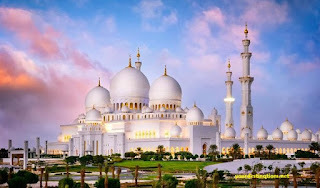 Sheikh Zayed mosque is practically unique and magnificent, because here you will find a mosque with 82 domes typical of Morocco, more than 1000 pillars, four tower buildings in four corners of the mosque, and has a capacity of 41,000 worshipers. All the dome buildings are decorated with white marble and complete with a central courtyard. The mosque's main dome is 32.8 meters in diameter and 55 meters high from inside or about 85 meters from the outside. The overall architecture of the Great Mosque Sheikh Zayed can be referred to as a fusion of architectural Mughal, Moorish and Arabic. Around the mosque is built a series of ponds that will reflect the shape of the mosque's arcade, providing spectacular views under the light of night lights. The interior walls of the mosque are beautifully designed with marble material combined with floral carvings. The mosque is dominated by white. While the pillars of the mosque are also coated with white marble decorated with the floral and gold coating. Very amazing..! Yas Marina circuit was designed by German architect Herman Tilke. This circuit is one of the most luxurious circuits in the world, located in Abu Dhabi-United Arab Emirates Yas Marina Circuit has a capacity of 41,093 seats, built in 2007 and began to open since 2009. To build the circuit with this international class the Abu Dhabi government spent a fantastic fund of 893 million euros (about 13 trillion), this circuit also became the second circuit of F1 in the Middle East, after the Bahrain International Circuit. Yas Marina has 21 bends with a 5.555-kilometer long trajectory. This circuit has two long straight lines, before entering a series of bends around the marina, which makes this circuit like Monaco in the desert. In addition, this circuit also has an elaborate pit-lane outlet, where a rider has to go through the turns in the tunnel before reentering the track, the sensation is roughly the same as you get out of the underground parking area. Ferrari World is a Ferrari theme park located on Yas Island, Abu Dhabi. This amusement park holds the title of "largest indoor amusement park in the world" which is the largest garden in the world using indoor concept. Ferrari World has an area of 200,000 square meters and is the largest indoor concept park in the world. Most interestingly, the roof of the park is an iconic Ferrari World designed by Benoy Architects. It is also the largest Ferrari Logo ever made using 12,370 tons of steel as this roof cover. Ferrari World which officially opened on November 4, 2010, there are many rides game. One of the most popular rides is the Fastest Roller Coaster in the world with a maximum speed of 240km / h.
If you are exploring Abu Dhabi, besides the famous tourist destinations with super-luxurious buildings, Abu Dhabi also offers shopping tours, one of them at Marina Mall. Marina Mall is a haven for shopping because here you will be very satisfied with international class branded goods. Marina Mall is a great place for shopping, located next to the Corniche-Abu Dhabi, consisting of over 300 stores. In addition, there are also four supermarkets, two hypermarkets and has several small boutiques for international shopping brands. Here you can also visit some of the popular shops in Marina Mall, Abu Dhabi including Woolworths, Carrefour, Versace, Burberry, Plug-Ins and Book Corner and more. If your shopping instinct wants to be satisfied then by visiting Marina Mall, you will get the sensation of a unique shopping experience. Heritage Village is one of the most popular tourist destinations in Abu Dhabi, located on an island connected to the city by using bridge access as its link, with a tourist destination knowing the heritage of the history of this area. Heritage Village is located in an area of 1600 square meters managed by Emirates Heritage Club. There are many interesting objects in this area, ranging from mudstone houses, Bedouin culture, traditional markets, old fishing village and traditional mosque. There is also a kind of workshop where craftsmen show traditional skills, such as metalwork and pottery, while women sit weaving. The craftsmen here are happy to share their skills, so no wonder here you will also get a chance to try it. Emirates Palace Hotel's location can be said to be in the heart of Abu Dhabi, only about 40 minutes from Abu Dhabi International Airport, located on the Corniche. This hotel is a favorite for you for business, leisure and exploring Abu Dhabi. Emirates Palace offers a magical place to enjoy the riches of the Arabian Gulf. Here is also the right place for you to do the culinary tour because in this place provides various international dining options. One of them is famous Mezzaluna, here you can also taste typical Mediterranean cuisine while enjoying the view of the marina is very fascinating. And the most unique, this hotel brings the grand but traditional Arab architecture. The Emirates Palace Hotel is truly one of the most inspiring hotels in Abu Dhabi. Its service is also very satisfying with luxurious rooms and offers the latest technology guaranteed to be very satisfying to you. Al Maqtaa Fort is a fortress, built as a defense against the bandits. Al Maqtaa castle has traditional middle eastern architectural ornaments. This fort was once used to observe the surrounding area. If you visit Al Maqtaa do not forget to capture amazing moments with the contemporary Al MUqtaa Bridge but be advised to be careful when you click photos because this area is a very sensitive military zone. The Women Handicraft Center is a center for promoting traditional weaving, embroidery, baskets and all creations from Emirati women. Workshops are usually organized regularly to display traditional weaving styles for the visitors. This place you can see the ladies really prepare their handicraft items such as Arab oil, embroidery, and weaving. And just info, for you lovers of photography, this place you are not allowed to capture the moment without the knowledge of the concerned. It can be said camel souk This is the last souk of its kind in the United Arab Emirates, its location to the east of Jebel Hafeet in Al Ain, and here is an excellent opportunity for you to observe camels from close range, as well as to see and hear merchants discussing prices and benefits of their animals. Just a suggestion, in this place, for those of you who love photography should be careful when directing the eyes of your lens because here the parents must always ask permission first. Maybe some have very good give. And here you also must always be vigilant, because usually many offer tour services but you should explore yourself, it will be much freer. That's why several tourist destinations in Abu Dhabi with all its glory, which certainly challenges you to soon be explored, just a suggestion, if you want to explore Abu Dhabi prepare everything with a careful calculation, and always include special people in your life. That will make your holiday fun, Nice !, Hopefully Helpful!